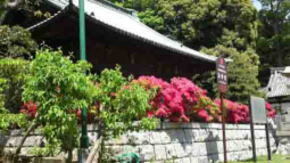 Hokkedo Hall in Nakayama Hokekyoji Temple is standing behind Yonsokumon Gate on a small hill on the west of Soshido Hall. Shochuzan Hokekyojishi and Edo Meisho Zue tell that it was called 4 kando since it had costed 4 kan (an old monetary unit). 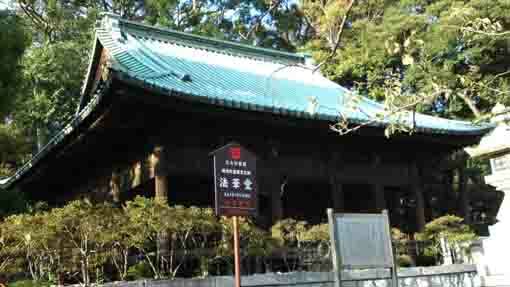 And Hokkedo is one of the oldest buildings in Nakayama Hokekyoji Temple. Katsushika Shiryaku said it was built in spring in 1359. 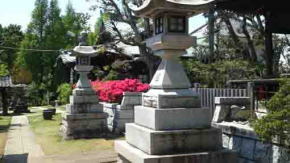 Shochuzan Hokekyojishi described that it was built when the venerable Nichijo was converted to the Founder Nichiren, and it is a scared building of Nichiren since he held the hounderd days preaching there. 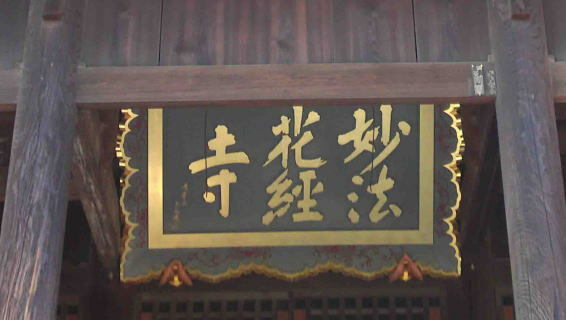 Moreover, the letters in the frame hanging on the front of Hokkedo Hall was written by Koetsu Honami. 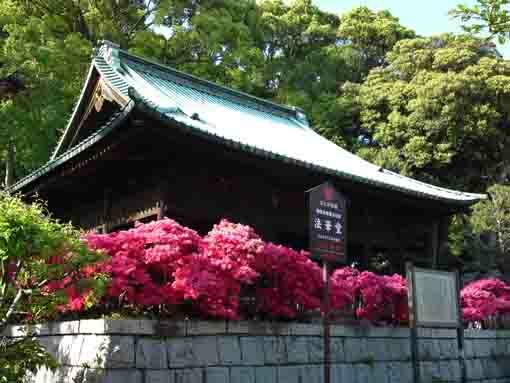 In spring, under the blue sky, Hokkedo Hall colored in pink with many azaleas blooming around is beautiful. Why don't you visit it? 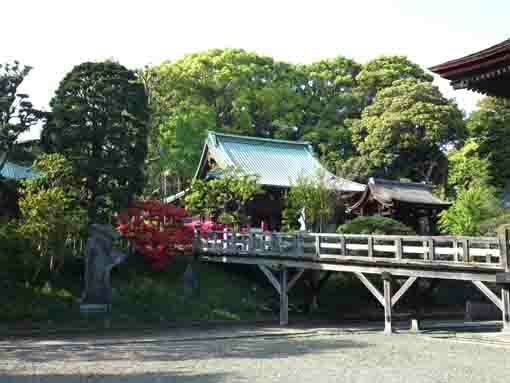 Architectural structure; The length of beam 9.1meters width, a single story in Irimoya-zukuri (hip-and-gable roof structure) with copper thatching the roof with shingles, with munafuda 5 mai (five wooden tags commemorating the foundation of the temple). 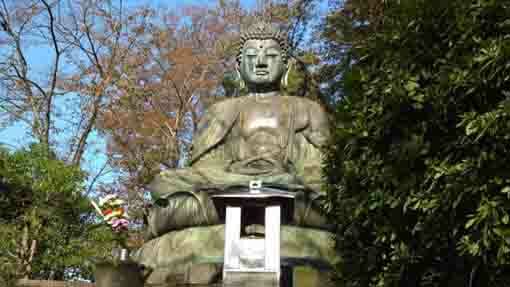 According to Edo-Meisyo-Zue, Hokke-do had dedicated the statue of isson-shi-bosatsu carved by the founder Nichiren. 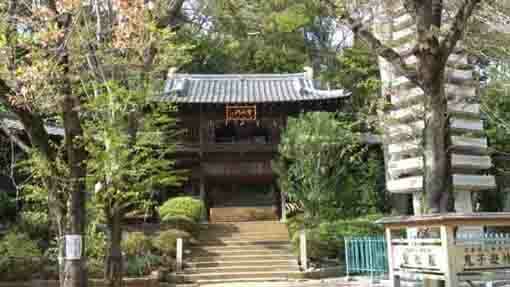 Noriakira Ota learned a lot from Jonin Toki built the Buddhism hall in his yard as it called Honmyo-ji Temple. The Hokke-do is built by skilled carpenters from Hida in Kamakura Period. 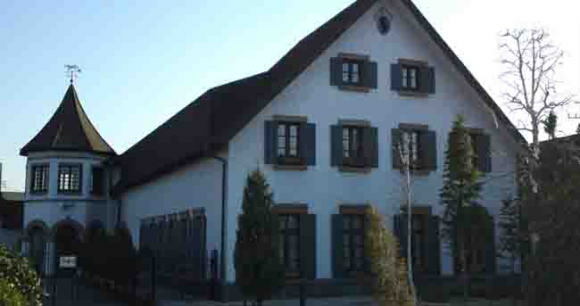 The hall is the first place where the founder Nichiren had preached his own interpretation of the Lotus Sutra. And it also introduces the sentences in the letters Nichiren and Jonin Toki talking about the construction of Yon-ken-do. The architectural structure and style in Hokke-do now in Hokekyo-ji obviously shows that it might be rebuilt late Muramachi Period. Originally, it stood at the same ground as the Soshi-do, it moved to the present location when Soshi-do started to rebuilt in Mid-Edo Period. The Hokkedo is basically designed Zen-Sect style, and it skillfully adopts Japanese style. 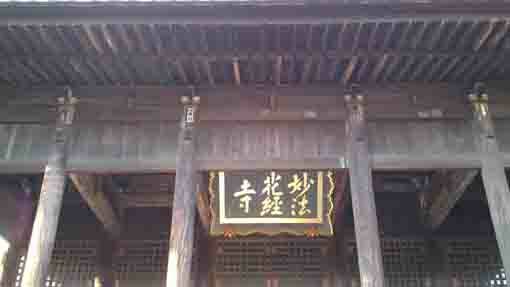 The hall is the important historical assets, so it is one of the oldest Buddism halls of Nichiren Sect. Koetsu Honami was a creative artist early Edo Period living in Kyoto. He was born in the distinguished sowrd appraiser, and given the land at Takaga-mine in northern Kyoto. 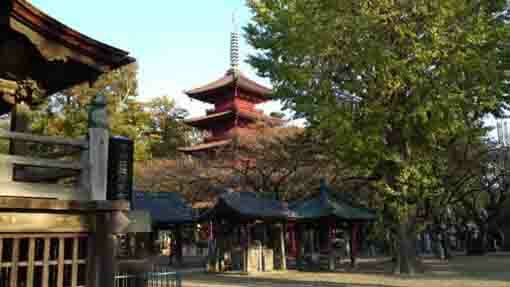 (Now there is Koetsu-ji Temple) He was famous for one of the three great calligrapher in Kanei. He learned Japanese painting a lot by Yusho Kaihoku, and belonged to the Tosa group and he had given some influence to Sotatsu Tawaraya and Korin Ogata later. He created new techniques to make Makie. He had some genius talent on the Ceramic Art, the Carving Noh-mask,the Gardening and so on. And he established the school of tea ceremony. ※　the three great calligrapher in Kanei; Tadanobu Konoe, Koetsu Honami and Akinori Shokado in early Edo Period. 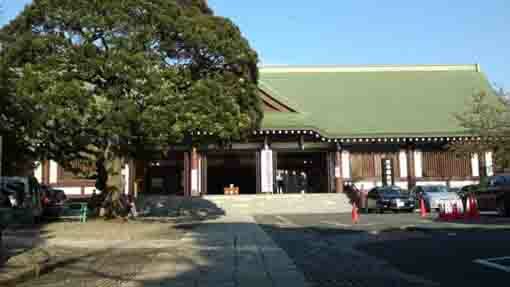 Hokkedo Hall in Nakayama Hokekyouji Temple has a great accessibility from both Narita and Haneda International Airport. It dedicates Hokushin Myouken Star that the Chiba Family deeply believed in , Hokekyoji traditionally succeeds. In November, Tori-no-ich is held in the site to dedicate the star.